Be the first to share your favorite memory, photo or story of Karla . This memorial page is dedicated for family, friends and future generations to celebrate the life of their loved one. Beloved mother, grandmother, and great-grandmother passed away on March 30, 2019. Born in Rawlins, WY, to Russ and Corinne Millay, the family moved to Lakewood, Colorado before Karla began her schooling, graduating from Lakewood High School in 1952. She attended Colorado State University and later transferred to the University of Denver, where she was a member of Gamma Phi Beta sorority. It was at DU where she met and later married her husband, Bill Sorensen, and began the life of an Air Force wife while he was in pilot training. They had two children during military service, born at Air Force base hospitals in Arizona and Texas. After military service, the family moved to Applewood in Lakewood, where she raised her family and spent her remaining years. Karla’s outgoing personality and flare for entertaining offered years of memorable holidays and spectacular parties. She had many talents that enabled her to donate hours contributing to costumes for school productions, uniforms for high school athletic activities, and Halloween costumes for grandchildren, as well as furnishing her home in an exquisite manner. She loved taking meticulous care of her yard and especially enjoyed creating beautiful flower pots each summer. 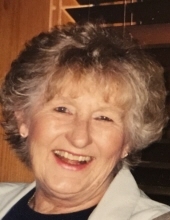 Her deepest love and top priority was her family: taking interest in her children’s hobbies and friends, watching granddaughters participate in sports, and spending the days of summer with family by her pool. She was loved by many friends and known for her giving heart. Karla was a 60-year member of PEO of chapter CV in Arvada, where she enjoyed friendships with her many PEO sisters. She also volunteered her time after her children were grown as a docent for the Denver Zoo, and then as a board member for the Denver Dumb Friends League, where she helped with the very first Furry Scurry race at Washington Park which 26 years later has turned into the nation’s #l dog race. Karla’s journey through life changed ten years ago when she was diagnosed with Alzheimer’s disease. Her gentle, kind disposition never changed as the disease progressed, and she remained sweet and mellow throughout her battle, with glimpses of her engaging sense of humor peeking through to the end. She was moved to Mountain Vista Health Center three years ago. Karla was predeceased by her parents, Russell and Corinne Millay, and her sister, Karen (Millay) Smith. She is survived by a daughter, Sharon (Mark) Fightmaster, and a son, Bill Sorensen; three granddaughters, Michele (Courtney) Wilson, Melissa (Adam) Summers, and Morgan (Kellen) Wise; five great-grandchildren (plus another one due soon); and a brother, John (Janet) Millay of Wolfeboro, NH. A Celebration of Life is planned on her birthday, June 5, at Applewood Valley United Methodist Church. More details later. In lieu of flowers, donations can be made to the Alzheimer’s Association or the Denver Dumb Friends League. To plant a tree in memory of Karla M Sorensen (Millay), please visit our Tribute Store. "Email Address" would like to share the life celebration of Karla M Sorensen (Millay). Click on the "link" to go to share a favorite memory or leave a condolence message for the family.